This month, students off all ages have been returning to the books. Whether you are a student or not, we have got you covered learning some of our favorite conservation science terms we use regularly in our work. Impress yourself and your friends with this new knowledge. A shallow depression that collects water and filters it slowly back into the ground. Rain gardens naturally filter pollutants and keep Puget Sound healthy. Both public and private citizens can install rain gardens to help save Puget Sound’s water quality. A watershed is an area of land that collects and delivers water to a single point. By studying an entire watershed, scientists can better understand the entire system and improve water quality, fish habitat, flooding and reducing soil erosion. What is a log jam? 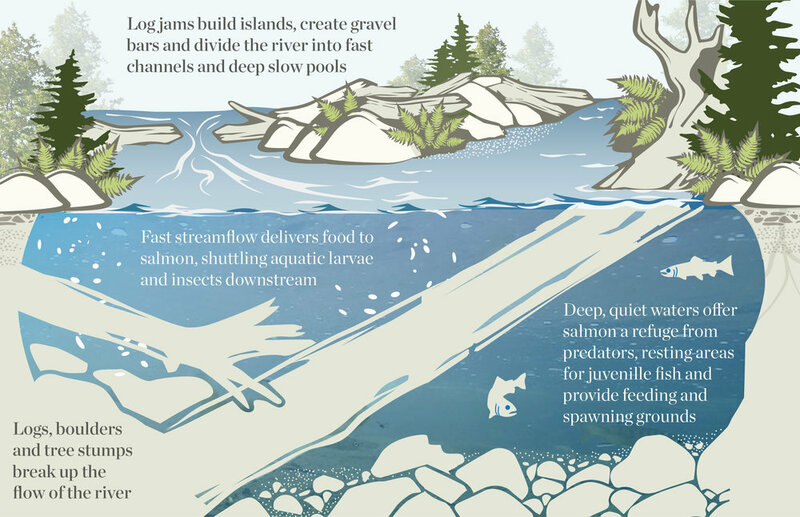 A log jam is a buildup of wood debris creating deep pools for salmon. Installations of log jams have become a priority method to recover salmon habitat and reset stream flows that have been affected by a century’s worth of logging. Whether you are a student or not, we have got you covered learning some of our favorite conservation science terms we use regularly in our work. Impress yourself and your friends with this new knowledge.